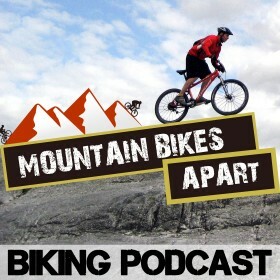 In this episode of the Mountain Bikes Apart podcast, we look at the gadgets you’ll want to bring with you on your ride. Tools like GPS devices and even basic cycle computers can be useful for a number of reasons. They can help you to pace your ride, so that you don’t run out of gas miles from home. They can help you navigate a new route and stop you getting lost. They can also record your effort for post- ride analysis, helping you to keep track of your training and make sure you are continuing to progress. In this show, we’ll go through the various options available, discuss what’s good and bad about each option, and try to help you decide which type of device might work best for you. Many of us start out with what is a very basic cycle computer. These little units sit atop the handlebar, and show simple metrics like speed, distance and time elapsed. Computers by the likes of brands such as Sigma and Cateye are perhaps the most commonly seen out on the trail. Many of them won’t have a GPS-tracking function and will only show you metrics as you ride, rather than allowing you to download what was recorded for post-ride analysis. What’s good about them is they’re cheap, reliable and will help you add some kind of structure to your riding! Perhaps the most recent type of gadget to grace the handlebars in recent years is the smartphone, and it should come as no surprise. Modern day phones are incredibly powerful and using apps, can show and record just about anything you want. As Colin and I discuss, using a system like Quad Lock will ensure the phone is extremely securely mounted, and should go some way to relieving fears of a £500+ device sat precariously on your handlebars! That being said, if you crash, you could be in for a hefty bill, which is probably the biggest downside to this setup. However, phones are fantastic devices to use for cycling because of their large screens, their robustness and their use of apps. You’re not tied to the functions of a single device and can therefore use whichever app suits your type of riding the best. Arguably the best bet for recording your rides and displaying data as you go is a dedicated cycling GPS device, like the Edge-series from Garmin. These devices are specifically designed for cycling, and so have form factors and functions that are perfect for mountain bikers. These devices show everything from heart rate, power and cadence, to maps, speed, distance and time, but also now things like live Strava segments and virtual training partners. With more and more people wanting to analyse their training post-ride, as well as compete with each other on networks like Strava, Garmin’s and similar devices are now incredibly popular. I would personally recommend the Edge 810 (or the new Edge 820 just released) as I have 1,000s of miles using the device, and it’s incredibly reliable and easy to use. The devices we’ve discussed here record a lot of information, to put it lightly! Once we’ve logged all this data, we’re going to want to organise and analyse it to make the best use of it all. That’s where post-ride apps and social networks come into play! Strava is by far the most popular app out there, blending solid analytical tools with a social network that allows you to compete over “segments” all around the world. It’s a great way to find new people to ride and compete against, as well as to motivate yourself to get out and actually ride. What’s more, it can help you get fitter as you strive to get faster over particular segments. You can check my Strava profile here to see all of my training, KOMs and ride photos! Other apps on the market are geared towards the analytics and are used to plan and track training and fitness. These include Garmin’s own Garmin Connect, as well as TrainingPeaks, which is a very popular suite within the professional ranks. Both organise your rides very clearly, and allow you to track your form and fitness coming into big events in the season. We want to know exactly what gadgets you use when out on the trail! Please let us know through the contact form on the website, or drop us a tweet at @colinmcgray or @bytombell. As always, please feel free to ask us anything mountain bike, and we’d love to get a question from you to answer in an upcoming Q&A podcast!